lisaspiralreads.com Because 50 book reviews in a year is a challenge. This is a delightful tale that promises to be a new classic. It is as likable as The Wind in the Willows or Alice’s Adventures in Wonderland and would appeal to the same age group. Charles Vess’s watercolor illustrations have a dreamy quality reminiscent of the Beatrix Potter illustrations. Our young heroine, Lillian, is a wild child and a dreamer. She is an orphan being raised by her Aunt on hard work and old stories. Lillian wanders freely in the woods once her chores and her home schooling work is finished for the day. She keeps hoping to spy a fairy, but she can never seem to find one. She’s warned, “When it comes to spirits, it’s best not to draw their attention. Elsewise you never know what you might be calling down on yourself.” But Lillian just want to say hello. The dilemma of the story comes early as Lillian falls asleep under a tree and gets bit by a poisonous snake. This happens to be the tree where all the forest cats congregate. Lillian is friendly to everyone. She leaves milk out for the wild cats, shares the chicken feed with the wild birds and always leaves a biscuit under the oldest apple tree for the Apple Tree Man. The cats know she will die if they don’t do something so they work a large magic, and turn Lillian into a kitten. From this point on in the story Lillian’s adventures take her into the world she always wished she could see. She also learns that magic has consequences, and usually you don’t like them. The story is about how hard she works to make everything in her world right again, even if it means she might end up a dead snake-bit girl. This would be a great read aloud chapter book for young school age children. 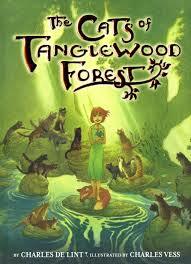 It would be a charming tale for a young girl, especially a forest child and a dreamer. Even as an adult I was delighted to be swept back into my own childhood dreams. Charles DeLint is a master of modern fantasy and ‘real world’ magic. Much of his material is geared to an older audience, and some of it can be very dark. This is a simple tale told with great depth and mastery. I highly recommend it.